According to the National Kitchen and Bath Association, transitional style is the most popular choice for homeowners who are remodeling their kitchens. It's not hard to see why: transitional style blends the best of both traditional and contemporary design, creating a space that feels classic, yet updated and current all at once. Transitional kitchen design is also our most popular requested style at Divine Design Build - the majority of the kitchens we do have elements of both traditional and modern design, and the results are always beautiful. If you're looking for transitional kitchen ideas, here are a few of our favorites from client kitchens we've designed recently. 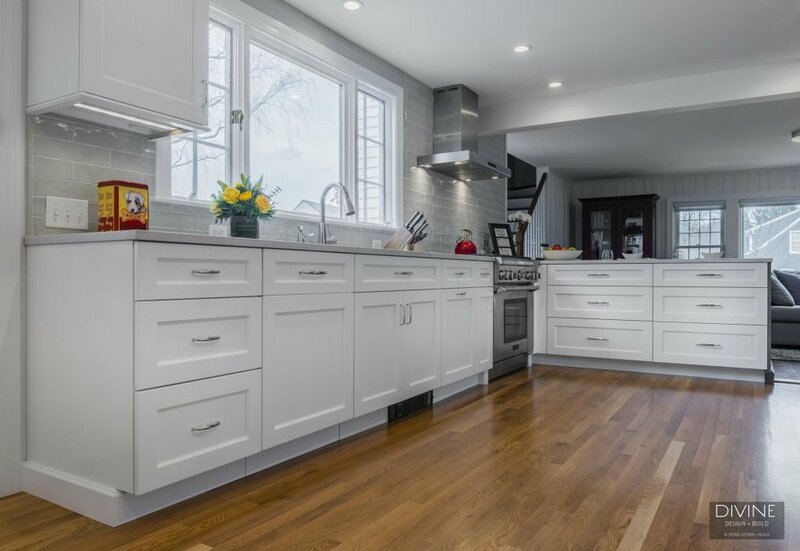 Shaker-style cabinets are the ideal choice for a transitional kitchen. Their recessed-panel style and trim skew traditional, while the clean lines and simple design feel modern. You can tailor the look with hardware, since the door style with go with almost anything. Two-tone cabinetry is a big trend in kitchen design that will instantly make any space feel updated and current. The beauty of it: It works with both traditional style cabinetry and contemporary. We especially love the combination of gray and white. 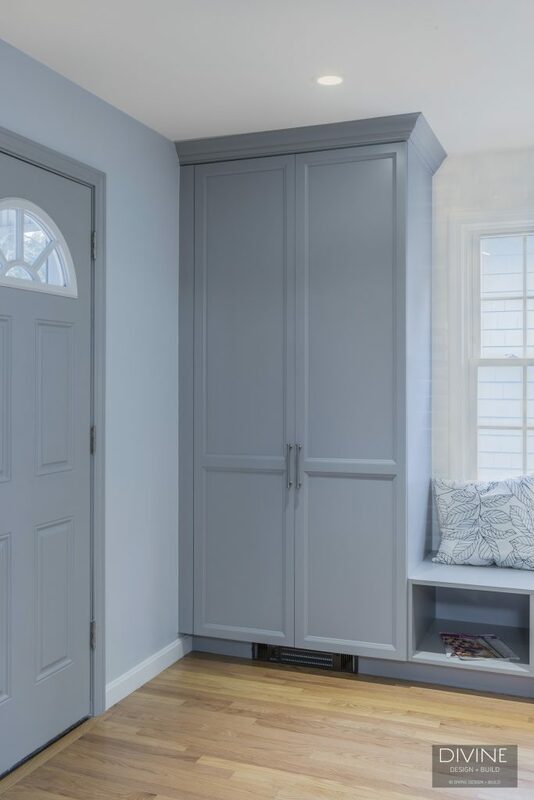 If you prefer your cabinets be all one color, try gray. White has been the color de riguer for the last few years, but gray offers the same neutral base with a more of-the-moment feel. Brass has historically been a traditional finish color, but over the last few years it's also become a big trend in hardware, which makes it a perfect choice for transitional spaces. Transitional design is all about balancing styles, but with lighting, we prefer to go the more contemporary route. Lighting is much easier to swap out that cabinetry or countertops, so you can choose something that's on-trend now (like the industrial style pendants, below) without worrying that you'll have to live with it for 20 years. 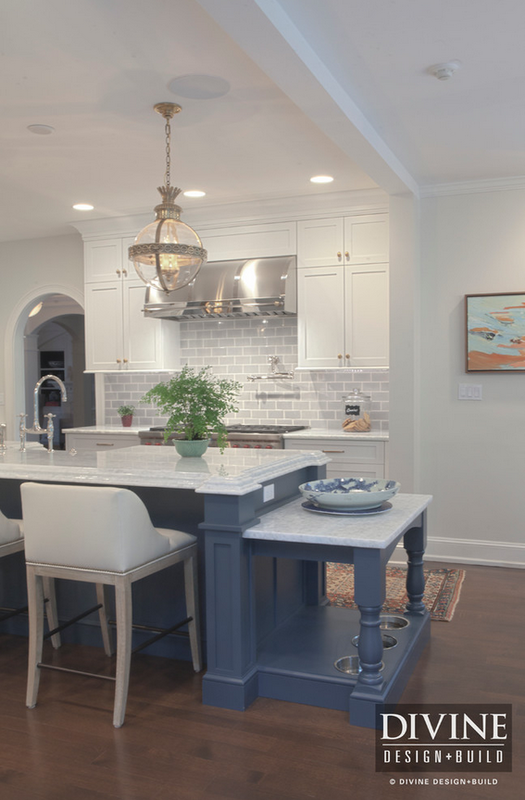 The subway tile backsplash is everywhere, but we still love it for transitional kitchens, again, because it's a trend that also happens to be a timeless design choice. Subway tile is clean, simple, and practical, and accents a transitional space beautifully. If you want something a little bit different, try choosing subway tile in a shade of gray or pale green, or choosing beveled or marble tile instead.